Brown Pro is a contemporary typeface created by Nick Shinn and published by Shinn Type which is available in 9 weights matching italics, OpenType functions and language support. Naturally narow, lining grotesque figures are ideally proportioned to complement Brown’s semi-condensed letter forms, in both cases. The signature letters consist in: spurless, with a wide center stroke, vestige of the oldstyle, curved, angled leg. Enjoy! 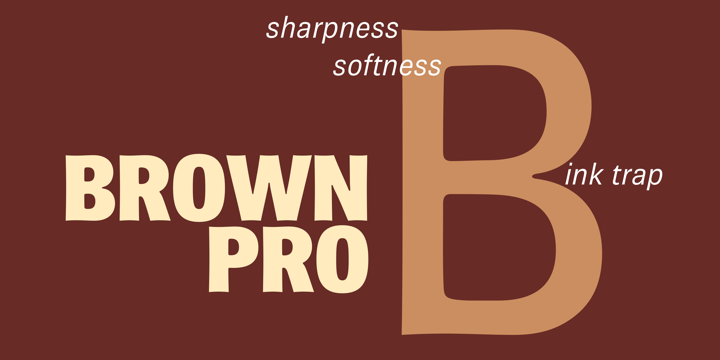 Note: “Brown Pro” is a trademark of Shinn Type. Price: starting from $39 for one font to $249 for all 19 fonts. A font description published on Thursday, March 31st, 2016 in Fonts, Nick Shinn, ShinnType by Alexandra that has 2,683 views.